Thanks to Jenna Kutcher and The Goal Digger Podcast, I now understand the value of Pinterest. It only took 9 years, but as of early March 2019 I am officially addicted to the pin. 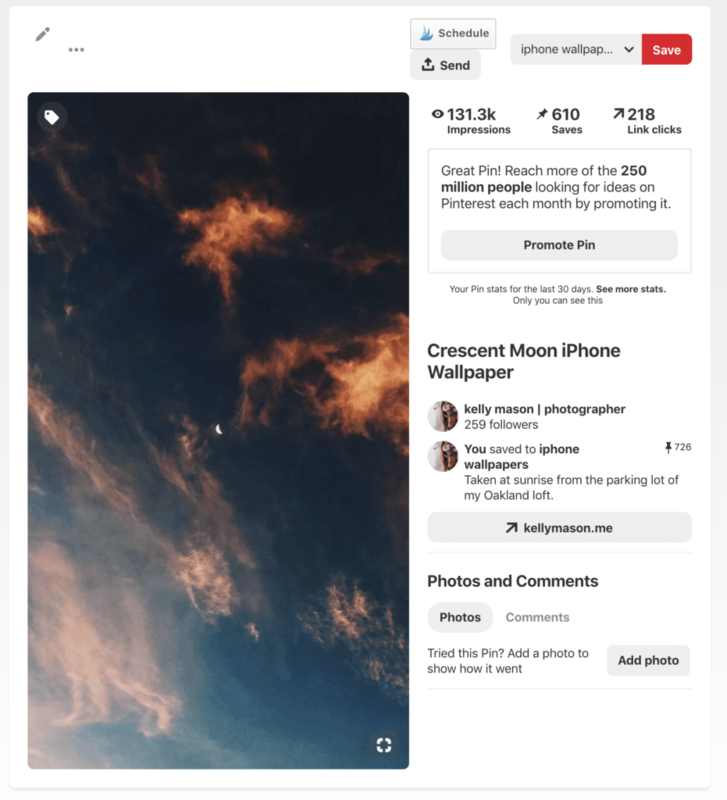 Pinterest is not social media. It’s a planning tool. Pins live for much longer than your average social post, with potentially weeks of life as opposed to a day or two. People use Pinterest to help them do life better. It’s the place where you can curate exactly what you want your IRL to look like. 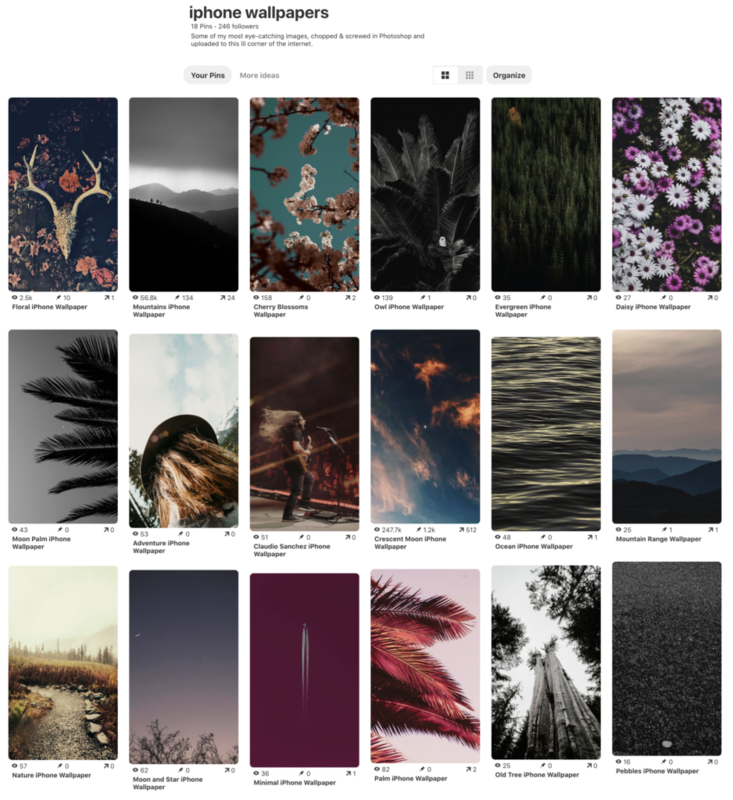 Everything you pin is beautiful, inspirational, or useful to you. After a couple of weeks pinning other people’s content to better understand the platform (and incidentally reading a few key business articles from Pinterest), I learned that keeping your account active with 3-5 pins per day is ideal for maximizing eyeballs on your content and every board you create should contain at least 50 pins. Keeping these two goals in mind kept up my momentum because I felt like my actions had purpose. 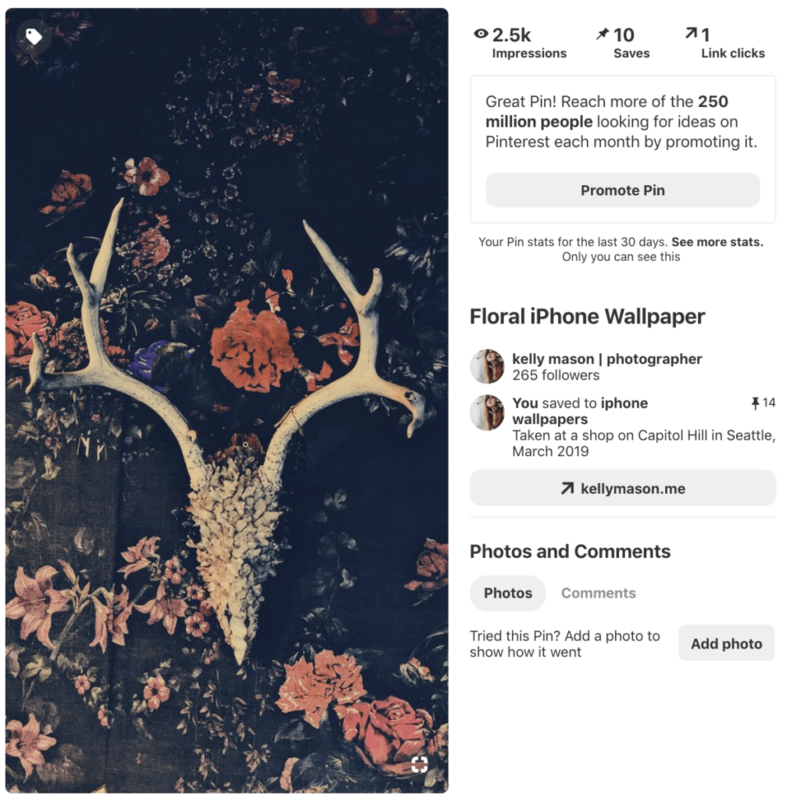 I set out to build up my account and finally started to realize the value Pinterest adds to my business–and with so much less effort than regular social media platforms. Like, 10% as much effort. Being a photographer for over half my life, I have tons of landscape and nature images that I have no idea what to do with. They look out of place on my website and aren’t relevant enough to be promoted to my core followers, but I still want them to be off my hard drives and enjoyed by other people. I set up a print shop and have sold a few prints, but this doesn’t really accomplish my goal of sharing my photography with as many people as possible. If you click the Pinterest search bar, it suggests relevant search terms. The first time I did this while I was trying to figure out what to pin, ‘iphone wallpapers‘ was the first suggested phrase. This felt like a decent place to start my experiment, so I gathered materials and started creating pins. At first I was simply opening photos in Photoshop and cropping them down as they were, but some images just did not look interesting enough without a little extra magic. Now’s the time to experiment with weird tones, baby. My general strategy is to only use photos that *spark joy* and use generic titles like Mountain iPhone Wallpaper and Crescent Moon iPhone Wallpaper. It’s important to me to keep my pins high quality and interesting, but I don’t mind a little blatant boring keywording if it will help me reach more people. All photos are then uploaded to a separate board called ‘iphone wallpapers’ where so far I have written bare bones descriptions with minimal keywords. I’ll return to more specific keywording once traffic slows down significantly and I run out of interesting photos to use. Let’s call this act of strategic laziness an A/B test. I started my ‘iphone wallpapers’ board around 3/8/19 and didn’t take a screenshot because I expected minimal results, but after a week my mind was blown. 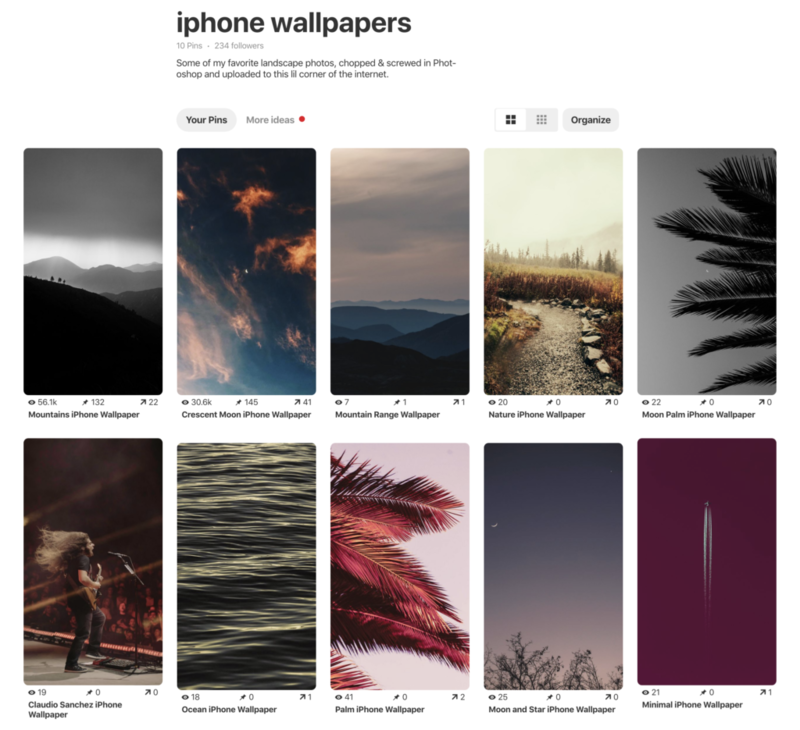 Two pins have taken off after 10 days, with almost 90k views, 177 re-pins, and 63 clicks between the first two wallpapers in the grid below. My first thought was: wait… this is actually working? Behind the mountains and crescent moon, my pink toned “Palm iPhone Wallpaper” has gotten the most attention. And my homepage. This doesn’t seem to be a huge number by power pinner standards, but after starting with 1.5k monthly viewers I’m feeling pretty solid about my progress. While we’re here, let’s talk about my title and bio. My title is straightforward. 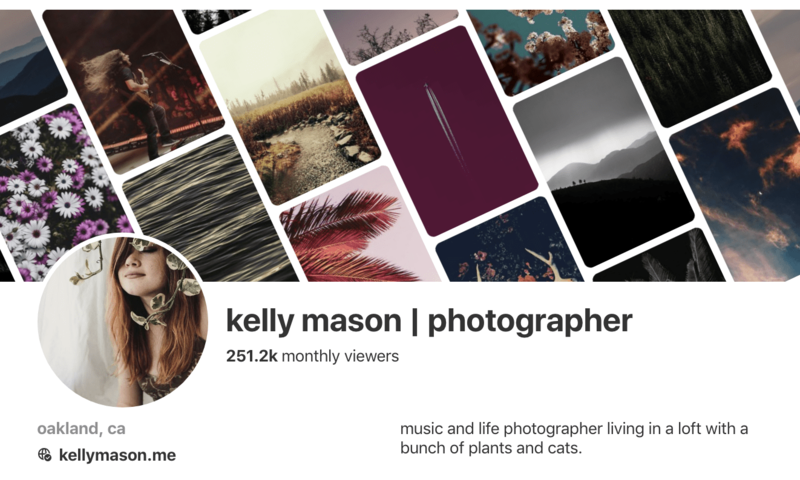 I recently changed it from Kelly Mason Photo (my photography business name) to something more accessible that still has authority, and apparently accounts that use this | thing typically have more followers. I think it’s just the nicest-looking and balanced way to separate your name from your title. 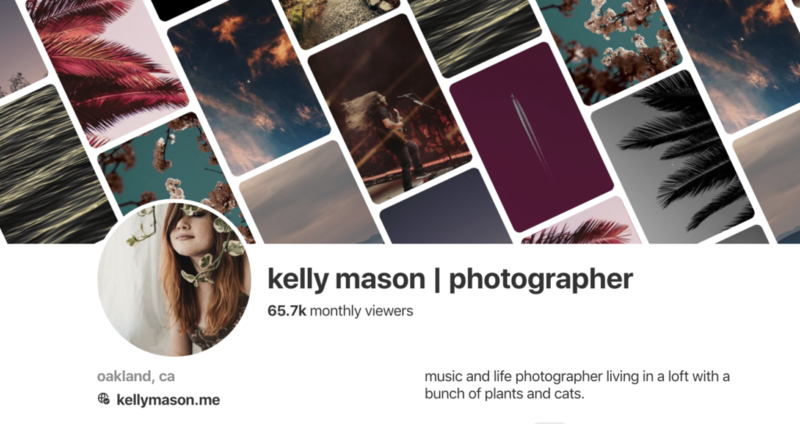 My bio describes the 5 basic things I pin: You can expect me to pin photography-related content, home inspiration for my loft, plant stuff, and cat tips. Not necessarily in that order. It’s actually pretty accurate, but I might change it later once I prove to the internet that I am a reliable source of creative business advice. 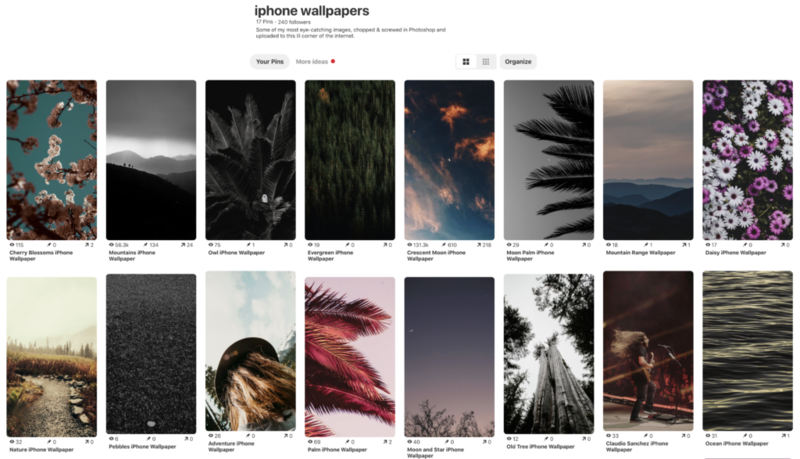 After week one, I started scheduling wallpapers directly from Pinterest at a rate of 1 or 2x per day. No real strategy here other than keeping my account active for several days in a row without having to do anything. Once I manually scheduled my first batch of wallpapers, I started using Tailwind and queued 7 days worth of pins from one of my blog posts in about 3 minutes. I’m still within the 100 pin trial period but so far highly recommend their service and Chrome extension–it makes scheduling so easy! You can even automatically schedule popular pins to repost regularly. No new pins have gained traction at this point, but my sunrise crescent moon photo appears to be the star child with 131.3k impressions, 610 saves, and 218 link clicks. WTF? I can’t believe this photo I took on my iPhone X is my most popular pin. And with no hashtags/very few keywords. Never underestimate the power of portrait mode. BRB selling my camera gear. Last night I uploaded a photo I took at a vintage clothing shop in Seattle that felt like it had Pinterest potential, and it worked! Maybe this is my first pin to link to this blog post? omg. Note to self: People love cool decor. And iPhone photos. Good thing I sold my camera gear. Here’s an update of the entire board with stats listed below each image. Some of the recent photos are actually doing pretty well! Anything over 100 is a win in my book; over 1k is an anomaly. You can see that my Crescent Moon photo has almost 250k impressions right now (+116.4k from a few days ago), with the other “viral” black and white mountains pin almost completely at a standstill (+500 views). A couple of other pins have broken 100, which also feels exciting, but so far my only other observation is that bright colors with striking contrast tend to do better. I’ll make sure my next batch of edits is more colorful. Check back every few days if you want to learn more from my experimentation with Pinterest! Please leave a comment if you have anything interesting to add. I’m still learning how to use this platform and welcome all the hot tips I can get.